RIT’s Ctrl Alt Deli: Quite possibly the ‘nerdiest’ delicatessen in America? RIT’s new Ctrl Alt Deli pays tribute, in name, to the “three finger salute” PC keyboard combination to reboot a computer. The eatery has been described as the “nerdiest deli” in the country. RIT’s recently opened Ctrl Alt Deli (pronounced “Control Alt Deli”) has a name that possibly only a computer geek could love—and, fortunately, RIT has no shortage of them. 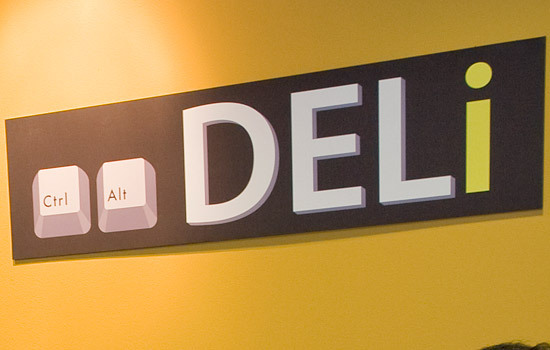 The deli’s moniker pays tribute to the so-called “three finger salute” (the personal-computer keyboard combination—Control+Alt+Delete—used to reboot a computer). The eatery—featuring “Mega Byte” and “Half Byte” sandwiches—is located, appropriately, in the atrium of Building 70, home to RIT’s B. Thomas Golisano College of Computing and Information Sciences. That means the 2,363 computer geeks—’er make that RIT students majoring in computer science, information technology, interactive games and media, networking, systems administration, and software engineering—help ensure a steady flow of customers. Michael Chin, a first-year computer science major from the Bronx, N.Y., submitted the winning entry—one of eight suggestions—in a naming contest. Though he has patronized the deli only a handful of times since it opened, he plans to return. An announcement about the deli, “tweeted,” fittingly enough, on Twitter, drew instant response. 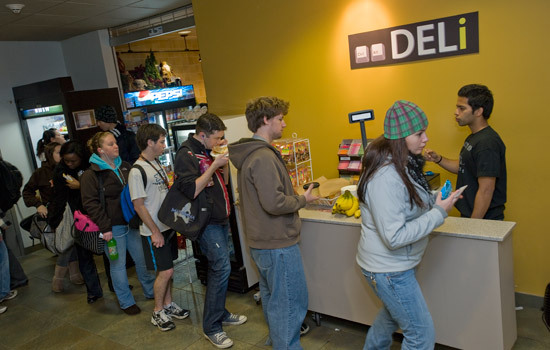 The Ctrl Alt Deli joins another on-campus outlet with a digital-age-themed name, Bytes on the Run, a “grab-and-go” convenience store that opened in the fall in RIT’s Student Alumni Union. “Nerdiest convenience store” and “nerdiest deli” in the nation? Sure, that sounds about right. And at RIT, that’s a badge of honor!